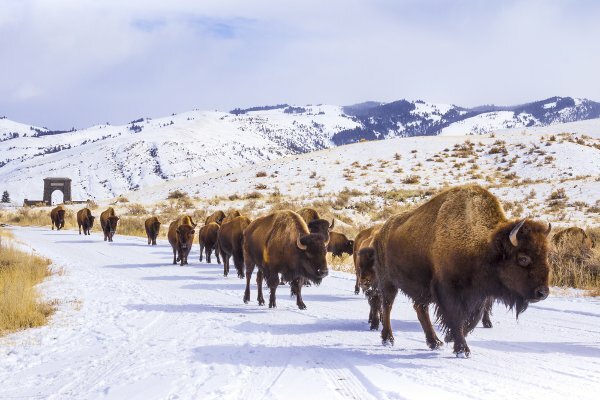 Wintertime in Yellowstone National Park is a step back in time. Can you imagine what life was life like when without automobiles? 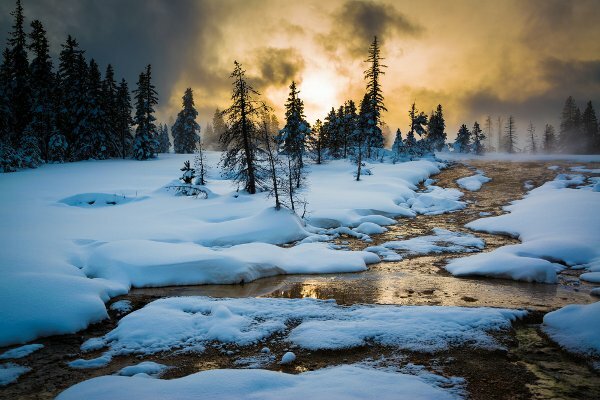 Pay a visit to Yellowstone National Park once the winter season arrives and you’ll quickly find out. Well, sort of. Due to heavy snowfall, vehicle access is restricted within the park starting around early November. Instead, those who wish to explore the epic Yellowstone do so on skis, snowshoes, snowcoaches and snowmobiles. This makes visiting during the winter challenging, but also creates the unique opportunity to see this magnificent park without huge crowds. 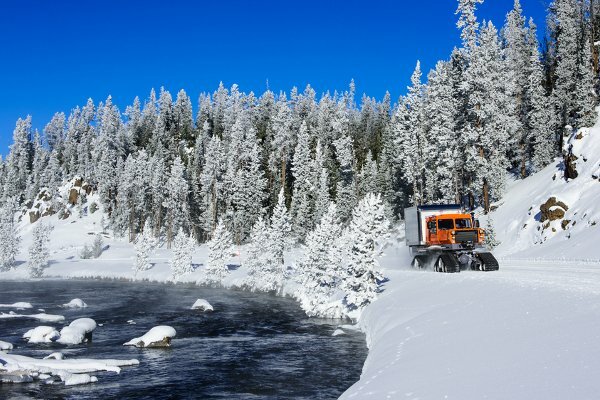 If you do plan to visit Yellowstone during winter, make sure to check the snowcoach schedule, as that’s the only way to travel far distances within Yellowstone during the cold season. 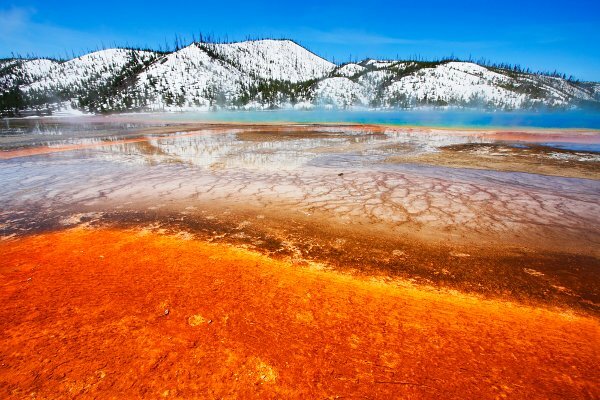 Yellowstone National Park covers a span of 3,500 square miles in Wyoming’s northwest corner. The park is open all year, although access to certain parts is restricted during winter and you can only enter at the north entrance. You can fly into the following airports during all four seasons: the Yellowstone Regional Airport (about 3.5 hours from the park’s north entrance), Jackson Hole Airport (about 6 hours from the park’s north entrance), Bozeman Yellowstone International Airport (about 2 hours from the park entrance), Billings Logan International Aiport (about 3 hours from the park’s north entrance) and Idaho Falls Regional Airport (about 5 hours from the park’s north entrance). 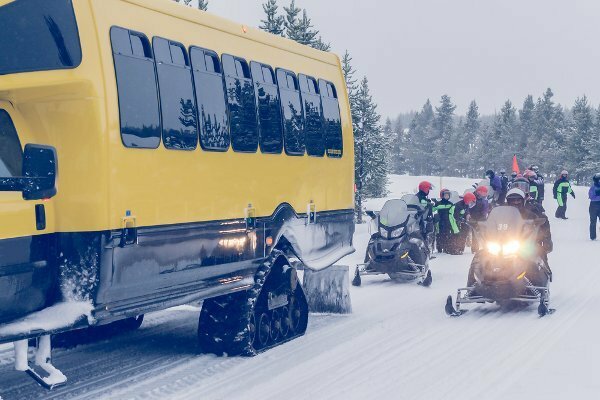 There are some busses available from Bozeman and it’s also possible to drive to the north park entrance during winter (the only one of five entrances open all year long). Most accommodation inside the park shuts down during the winter season. Usually, there are two lodging options open all year round, but unfortunately one of them – the Mammoth Hot Springs Hotel and Cabins – will be closed for the next two seasons for renovations. Visitors can stay at the Old Faithful Snow Lodge and Cabins. Here you can choose from a variety of room options suitable for up to four people. Though there are a lot of options to stay outside the park, we definitely recommend trying to get a room here if you can. Since traveling inside the park is so limited during the winter months, it’s much more convenient to be able to step out your back door and hike, ski or take a snowmobile to the main sites. As well, the Snow Lodge hosts many activities, excursions and tours. Check out more information here. The winter season in Yellowstone is the perfect time to see all of the park’s incredible nature in peace and tranquility. From the mesmerizing geothermal activity, to the golden glow of the park’s Grand Canyon, the herds of bison and the iconic Yellowstone Falls – there’s more than enough to explore during a single weekend. 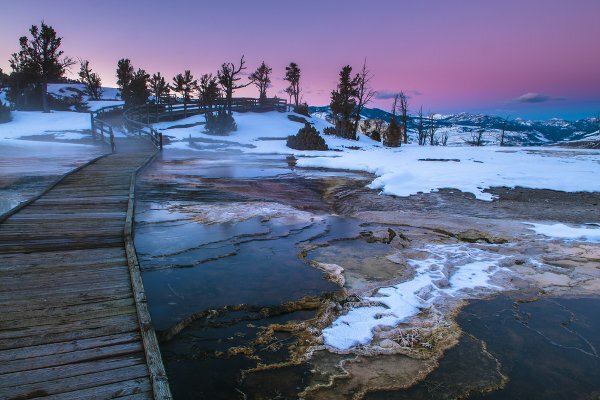 One of the most popular activities is to go snowshoeing in the Geyser Basin. This area of the park has the highest concentration of geysers and hot springs so you can not only witness the world-famous eruptions of Old Faithful, but also the other geysers such as Castle, Daisy, Grand and Riverside. Another great option for exploration is the Lamar Valley. This area of the park is known for large concentrations of wildlife, which are much easier to spot in winter against the blanket of white snow. As well, many of the animals that live on higher elevations in the summer come down to lower altitudes in winter in search of food. By hiking through this area you may be treated with glimpses of elk, big horn sheep, bison, foxes, coyotes and even wolves. For an added dose of adventure, snap on your cross country skis! Most of the park area is backcountry and wilderness, but there are a few trails with many miles available for skiing. Most trails are indicated by an orange metal marker, but it’s important to stay cautious as conditions can change very quickly and there are many factors – such as weather, unpredictable wildlife, open streams or avalanche areas – that can be dangerous. Check out the park website for most up to date information on ski trails. 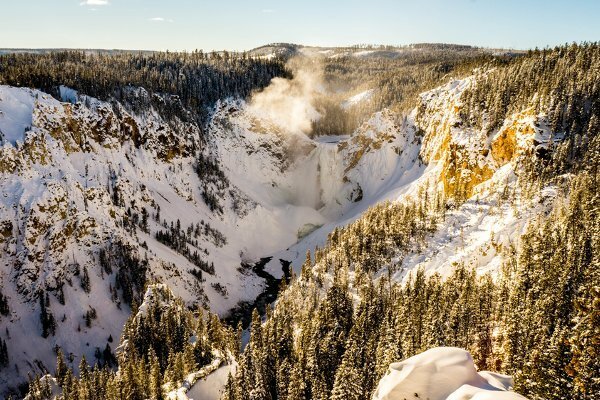 Hop aboard a snowmobile either at the Snow Lodge or Mammoth Hot Springs Hotel and jet off to the Lower Yellowstone Falls. Guides are required at all times when using the snowmobiles, but they will take you through the unexplored backcountry, revealing some Yellowstone’s most magical hidden sights on the way to the Falls. When you’ve thoroughly exhausted yourself with snow trekking, stop in at Yellowstone’s Boiling River for a quick outdoors swim. Don’t worry, the Boiling River is located on the spot where a large hot spring enters into the Gardner River and the mix of hot and cold temperatures culminates into water balmy enough to bath in, even in the coldest of temperatures. During the winter, most of the dining options are closed inside of the park. The Mammoth Hotel Dining Room is closed for the next two seasons, however the Terrace Grill is still open for fast food during breakfast, lunch and dinner. The dining room at the Old Faithful Snow Lodge is also open, as well as the Old Faithful Geyser Grill (with very affordable prices). 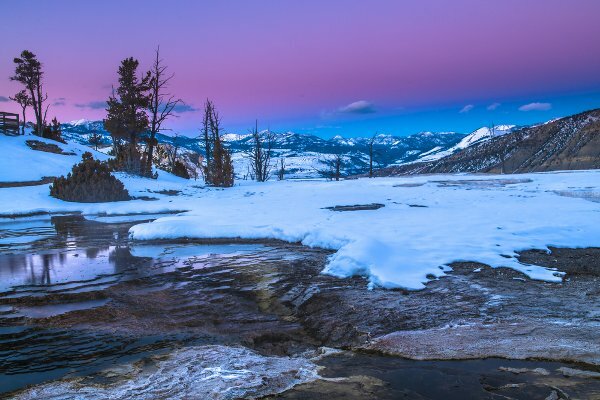 Solitude, serenity and spectacular scenery – this is what you can expect from a winter weekend in Yellowstone and a visit here could be the adventure of a lifetime!